Easy Roasted Potato recipe ideas. Roasted potatoes are perfect for meal prep. I’m talking about sweet potatoes or your regulation traditional white potatoes. I want to say for the record that potatoes are not inherently bad for you. In fact, they contain healthy starches that encourage the population of healthy gut bacteria. You want that! Of course like everything in life you want to eat potatoes, in moderation. If you’ve been writing them off as a complete no-no. It’s time to give yourself a little slack and have some delicious, responsibly cooked roasted potatoes. Roasted potatoes require almost zero prep work, they keep super well in the fridge and reheat beautifully. All of these characteristics make them a meal preppers best friend. You can also season them up in countless ways. If you’ve been hanging out with me at all, you already know I am a spice mix freak. I love making my own special blends that I can use to add fast flavor to my weekly proteins and veggies. 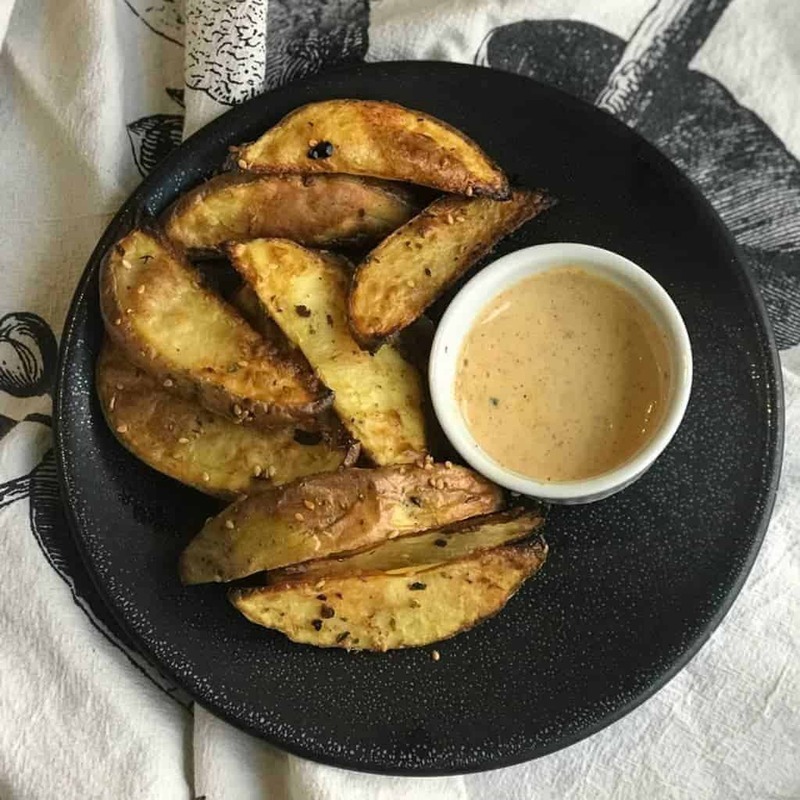 One of my favorites is featured on these gorgeous golden brown roasted potato wedges; Mediterranean Spice Mix, which is delicious on pretty near everything. Roasted Potatoes are so easy. Serve them with a fancy dipping sauce like Chipotle Ranch. Cut potatoes into cubes or fries, season and roast. Seriously – That’s really all there is to it! Roasted potatoes are super snackable in their own right. Plus, they pass my test of tasting delicious cold right out of the fridge. Seriously, am I the only one that does this? If you’re a dipper then, by all means, dip away! …Ketchup, a seasoned Mayo, Pesto, Tzatziki, Ranch dressing, even chipotle ranch dressing…you name it! You will find a few of these recipes right here. Roasted potatoes go well with most any meal, especially those that feature grilled meat. “You want fries with that?” Uh, Yeah! The recipe below calls for Yukon Gold potatoes, but virtually any variety of potato will work. I prefer the texture that you can get using the starchier potatoes, like red potatoes or Yukon golds. Sweet potatoes also work very well for this recipe. Cut to the shape you want – generally bite-sized chunks or fries. Here it is folks: My time-saving secret weapon! My special spice mix recipes that add super fast flavor to everything! Mix up a few of these. Have them on hand in clip-top jars and you are good to go. You’ll always be ready to whip up something delicious! The easiest roasted potatoes for every occasion. Super simple, super healthy. Preheat the oven to 425℉ If you have a roast setting, use that. Wash and cut the potatoes into evenly sized pieces. Think diced or my favorite, wedges. Put the potatoes into a roasting pan or on top of a baking sheet. PRO TIP: LIne the baking sheet with parchment paper for the easiest clean up ever. Toss the potatoes with oil, salt, and rosemary. After 10 minutes toss the potatoes so that they can brown on both sides. Continue to roast until golden brown. Usually, another 10-15 minutes. Time may vary. These can be served plain or with a variety of dipping sauces.